Many sheriffs and lawmakers are saying we need to do arm and train the nation’s teachers so they can go full Casey Ryback when the bullets start flying. But what about the armed teachers that are already in place? 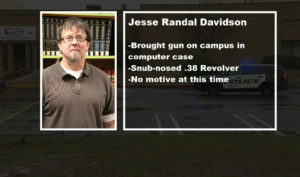 Dalton police say Jesse Randal Davidson, 53, a social studies teacher fired the shot. He also locked himself in a classroom. 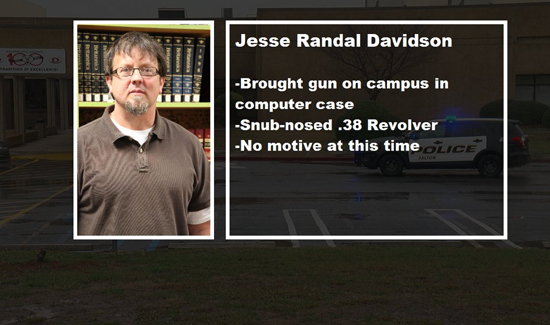 “When the principal put a key in the door to try to unlock the classroom, Mr. Davidson apparently fired a shot from a handgun to an exterior window of the classroom. It doesn’t appear it was aimed at anybody,” Bruce Frazier, with the Dalton Police Department, said. So the next time we want to make ourselves feel better by advocating commando-teacher programs, let try and remember this incident. There was no threat and someone could have been easily killed anyway. If you know a thing or two about the chaos of running gunfights, the fight or flight response, and the kind of training required to take down active shooters, it’s hard to imagine anyone describing this as a “common sense” solution to the problem at hand. But we’re too frightened to talk about common sense gun laws so it’s probably the best we got. WSBTV has some background on the shooter. Check out his recent history and ask yourself if you want this guy protecting your kids. Records show in March 2016, he went to Dalton police to confess he killed someone. Davidson told detectives that two friends killed a woman on his behalf because he had an online affair with her. Police were not able to verify the story. 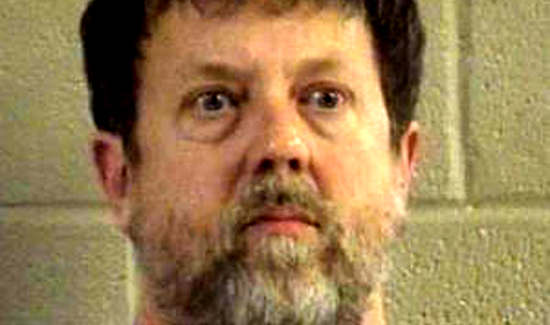 Davidson told them he was taking medications for depression. The report says he went to the hospital after the interview, because he was thinking about hurting himself. You shine that light on some folks in our LE profession, you will wanna take away their boom-sticks too. This guy gave several indications of trouble before he snapped out. Nobody’s talking about arming unwilling teachers. It’s like arming airline pilots. 9-1-1 doesn’t save everybody immediately, why not give self-protection a chance?